Wei Gao, who earned his PhD in the research group of nanoengineering professor Joe Wang here at the Jacobs School, has been named to the MIT Tech Review's list of Top 35 Innovators Under 35, better known as the TR 35. Gao, 31, is currently a postdoctoral fellow at UC Berkeley. There he continues to work on technologies similar to those developed by the Center for Wearable Sensors, led by Wang here at the Jacobs School. In January 2016, he was first author on a Nature paper titled "Fully integrated wearable sensor arrays for multiplexed in situ perspiration analysis." The study received broad media coverage, including in The New York Times, The Wall Street Journal, Scientific American, IEEE Spectrum, Wired and many other outlets. Essentially, Gao and colleagues built a sweatband that combines sensors with electronic processors and a Bluetooth transmitter on a flexible printed circuit board. The device wirelessly transmits data about what's in your sweat to an app on your cell phone. “I grew up in a small village in Xuzhou, China. When I was a child I saw a lot of people around me dying of different diseases. Many people don’t realize there’s a problem until it’s too late. I thought, in the future I should design a wearable electronic device to monitor health and tell us what’s going on and what’s going wrong before it gets bad. “Our body is generating data all the time. There are so many wearable devices now—the Apple watch, the Fitbit—but they mainly track physical activities or vital signs. They can’t provide information at the molecular level. Students in the 5-week Engineering Institute, a new summer program designed to expose incoming freshmen to engineering skills, have lunch with their faculty mentors. This summer, nearly 70 incoming and admitted Jacobs School students are participating in the IDEA Student Center’s Freshmen Summer Engineering Institute – a 5-week academic, summer residential program for admitted engineering students whose high school did not provide all of the opportunities and skills needed for successful engineering college experience. In addition to first year engineering coursework, students are exposed to a variety of programs that the college has to offer. The following is a recap of a seminar by the Academic Enrichment Programs office. The Academic Enrichment Programs at UC San Diego help students get hands-on research experience and prepare for a medical degree, Ph.D., or other advanced degree. They also provide avenues for faculty and student interaction, such as research mentor and can attend faculty-moderated roundtables at research conferences, or appear at informal gatherings such as Coffee and Conversation with Faculty. The California Louis Stokes Alliance Minority Participation (CAMP) in Science, Engineering and Mathematics programat UC San Diego provides support and advancement opportunities to students defined as underrepresented by the National Science Foundation (African American, Mexican American, Latino/Hispanic, American Indian, Alaskan Native, or Native Pacific Islander) who are seeking bachelor's degrees in chemistry, physics, cognitive science, biology, other sciences, mathematics, engineering and technology. Students must also be U.S. citizens or permanent residents. The Faculty Mentor Program is open to all students with a GPA of 2.7 or higher. Students serve as assistants to UC San Diego faculty. The Health and Medical Professions PreparationProgram (HMP3) provides undergraduates with enriching experiences that will enhance their preparation for admission into professional school in the medical and other health professions. Students are paired with a mentor in the field and attend pre-professional seminars. UC LEADS is a two-year program with a stipend that prepares students for their Ph.D. They spend one summer doing research at UC San Diego and another at a different UC School. The McNair Program is funded in honor of Dr. Ronald McNair, an astronaut killed in the Challenger crash. The McNair Program is a prep program for low-income AND first generation to college (or underrepresented AND 3.0 GPA) students interested in pursuing a Ph.D. The AEP Summer Research Program is one of the only programs that provides both a stipend and academic credit. During the summer, students complete 30 hours of research and 10 hours of seminars and GRE prep for 10 weeks. The Undergraduate Research Scholarship provides up to $5,000 for summer research. Over the last year I took part in the ECE Design competition. My team, “Fountain of Youth”, won first place (more on that later). The team consisted of myself (Ryan Collins), Gannon Gesiriech, Kevin Nematzadeh, and Boulos Haddad. All of us are electrical engineering students - except Boulos who was our business and marketing expert. Our goal was to design a product which helped mitigate the problems that come with aging. We designed a natural-feeling motor-assisted personal shopping cart that promotes activity and facilitates independent living. Originally, I was not going to take part in the competition because I was busy with student orgs, a heavy class load, and TA-ing, but once I found out that it would satisfy senior-design credit (thank you, Dr. Nguyen) I could make it work with my schedule. As many engineering students know, class alone isn’t sufficient to satisfy craving the we have for technical knowledge. One of my biggest goals this year was to carry out a technical project from start to finish so that I could talk about it in future job interviews. This project was perfect because it was multidisciplinary, included a business aspect, and had a direct application to a real-world problem. This project was year-long and consisted of three steps: First was team selection in the fall, then research/data gathering and conceptual design in the winter, and finally the product development and marketing strategy in the spring. We held monthly design reviews where each team has 5 minutes to present to fellow students, and faculty (including the renowned godfather of design Dr. Don Norman). These reviews helped tremendously because it kept us accountable for the progress we made, and we developed invaluable presentation skills. The design process for our team was pretty straightforward. First we went to senior centers and care facilities to talk to as many people as we could and learn more about the problems associated with aging. One of the interesting observations we made was that people tend to adapt to obstacles and have a hard time realizing their problems. We got around this by talking to caretakers and simply taking note of issues we had witnessed while observing people. We were able to group the majority of problems into several major categories including mobility, health, safety, and memory. We brainstormed possible solutions and determined that the most reasonable goal was to design something that would solve a problem in mobility. We had several people say that grocery shopping was difficult due to heavy groceries and long distances traveled. This was something we knew we could solve by motorizing a cart and making it as user-friendly as possible. We started with an already existing foldable shopping cart, and decided to retrofit it with motors and force sensors. The force sensors would read in the user’s force of push, and translate that into a speed that the motors should turn. Easy, right? Well it was easy on paper, until we actually started to build the prototype. The first month of development was difficult because we could not find parts that fit all our requirements. We had to settle, but we were able to work around all the problems we encountered. Word of advice: Avoid having to find motors. Finding the right ones is a nightmare. Eventually, we made enough progress to assemble our prototype. We built a custom motor mount in the ECE makerspace in the basement of EBU 1 (thanks to our advisor Professor Michael Yip for allowing us access). We also attached our force sensors, and wrote control code to read the sensors and output the motors’ speeds. We encountered many problems along the way, such as broken microcontrollers, mechanical issues, and safety of use. After a few long nights, and an all-nighter the night before the competition, we completed it. Though it did not feel as natural as we hoped, it worked. That was important because it provided a proof of concept and future improvements could always be implemented. During the competition, many people tested out the prototype, and we had an exceedingly positive response during the demo phase. When it came time to present, we had actually had lots of practice from monthly presentations and we had even competed in several entrepreneurial challenges (which we did not win, but we learned a lot from). Somebody after our presentation said that it reminded them of an Apple presentation, which was quite flattering, but I remain skeptical. In the end we took first place among some very dedicated teams. Dr. Don Norman said that the reason we placed first was because we showed the most consistent improvement throughout the design cycle from start to finish. We showed that we could set and meet goals, as well as use helpful criticism to improve our product. I also think that our presentation was engaging, and that we greatly benefitted from allowing people to get hands-on with our cart during the demo phase. The faculty were very accommodating, making the whole process a pleasure from start to finish. We learned valuable lessons about marketing a product, solving a real problem, and the compromises necessary in product design. A big thanks to our mentor and professor Michael Yip, and the ECE Chair Dr. Nguyen for his tireless assistance. Also to Dr. Don Norman for lending his immense design wisdom over the course of the entire project. Lastly thanks to the staff and faculty of the ECE department as well as the Center for Healthy Aging for their help. Summer interns from UC San Diego. These students represent multiple majores, including computer science and engineering, chemical engineering, electrical engineering, environmental engineering, nanoengineering, and Earth sciences. From left to right: Diana Alsindy, Christian Gutierrez, Hannah Munguia, David Ruble, Neil Chandiramani, Nicholas Lopez, Annie Chen, Nolan Fewell, Kyle Mirzakhanian, Rahul Palamuttam, Matt Epperson, Leon Cheung, and Caleb Christianson. A temporary tattoo that can be used to keep track of how drunk you are has become one of the hottest gadgets in the news this past week. The device was developed by researchers in the UC San Diego Center for Wearable Sensors, led by nanoengineering professor Joseph Wang and electrical engineering professor Patrick Mercier. The tattoo can be worn on the arm and works by releasing a drug across the skin that induces sweat. Electrodes that have been screen printed on the tattoo electrochemically detect the alcohol level in the user's sweat. 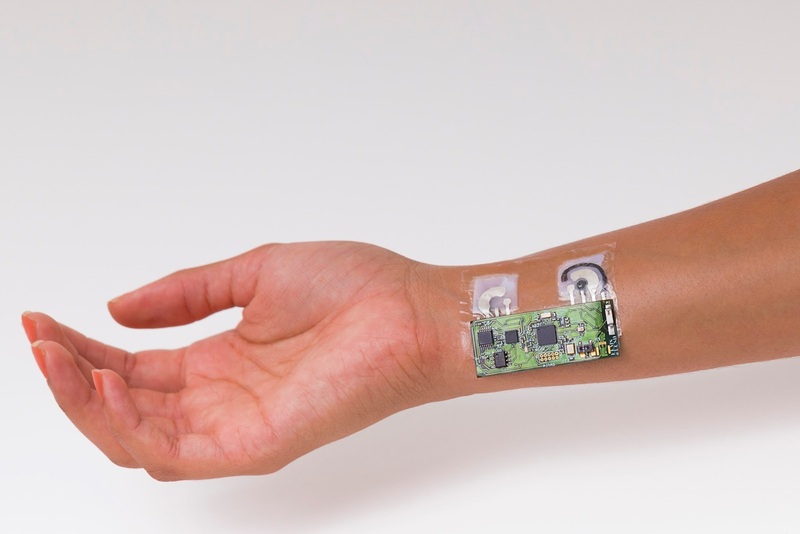 The tattoo is powered by a small electronic circuit board (about the size of a stick of gum) that communicates the data via Bluetooth to a mobile device. Researchers envision this device as a convenient alternative to a breathalyzer, as well as a tool to help prevent drunk driving incidents. For example, the technology could be integrated into a car's ignition interlock software to prevent it from starting if the driver is intoxicated. Or an AA sponsor could use it to check up on a sponsee. "When you're out at a party of a bar, this sensor could send alerts to your phone to let you know much you've been drinking," said Jayoung Kim, a materials science and engineering PhD student and co-first author of the study. "This device can use a Bluetooth connection, which is something a breathalyzer can't do," added Somayeh Imani, an electrical engineering PhD student who's also a co-first author of the work. The gadget has been featured in various media outlets including IFLScience!, BBC World Service, IEEE Spectrum, Yahoo Beauty, Glamour, Munchies, San Diego Union Tribune and NBC San Diego. Read the full press release and more details about the device here.